For my birthday today, I wanted to talk about one of my favorite Latvian foods: pelmeņi. I’ve always loved dumplings of all sorts, especially potstickers and gyoza which have been the source of many a great meal for me over the years. These aren’t very different – simply a different mix of ingredients. They’re not natively Latvian – pelmeņi are a very popular Russian (and previously Soviet) “fast food” and are found all over Eastern Europe. Then again, pelmeņi are related to ravioli, gyoza and wontons – every country and culture seems to have their own twist on stuffed pasta. When I first came back to the States from Latvia, I went to this little Russian store called Luybochka (959 E 3300 S Ste A, Salt Lake City) soon after in search of pelmeņi, dark rye bread and other foods I missed. I found he carried great homemade pelmeņi (ask, it’s behind the counter) along with a lot of stuff I’d been looking for, but it’s a long way from here to there when we don’t get into Salt Lake that often. Certainly not often enough to satisfy our pelmeņi cravings. There was only one thing left to do: make it ourselves. 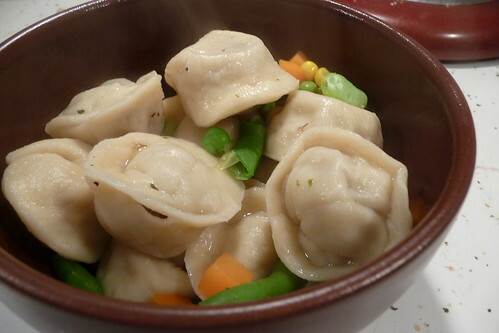 Making pelmeņi is as involved as making ravioli or potstickers (gyoza) by hand. You just have to roll out a very simple pasta dough and cut out circles, then wrap them around a bit of filling. It’s best done with friends or family around who can help fold. Following written directions on folding pelmeņi can be as difficult as writing them. I recommend checking out this photo recipe on Cāļa virtuve for step-by-step photos. Below, you can see my finished raw pelmeņi right before being frozen. Dough – Method #1: Mound the flour on a clean, large surface (cutting board, table, counter, etc..) and sprinkle with a bit of salt. Form a well in the center and crack the egg into it. Using your (clean!) hands, mix together into a dough, adding water until it comes together. (You may not need all of the water, depending on the day.) Knead until smooth and elastic – about 5 – 7 minutes. Let the dough rest for 30 minutes or so while you put together the filling. Filling: Grate, grind or process the onion and garlic, then mix all ingredients together thoroughly. Roll out the dough to about 1/8″ thickness. Using a small biscuit/cookie cutter or a glass, cut out as many rounds as will fit. I use a 2 1/4″ / 58 mm cutter myself. Spoon a small amount of filling – my rounds take between a teaspoon and a teaspoon and a half – into the center, then stretch the dough over it (as necessary) to form a half moon shape. 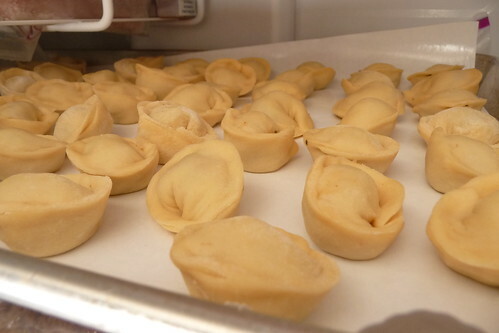 Crimp the edges shut, then bring the ends together and pinch – similar to a tortellini. OR: Cut even smaller rounds out and place the filling in the center of half of them. Cover each round of filling with another dough round and crimp the edges down. Freezing: If you’re not planning to cook them all immediately, arrange the pelmeņi on a sheet pan and place flat in a freezer for several hours. Once they have frozen completely, seal in freezer-safe ziptop bags and freeze for up to 6 months. Cooking and Serving: For a full meal, I figure about 150g to 200g of pelmeņi per person. There are several ways you can prepare these – these are two of my favorite. Method #1: Cook the pelmeņi for 10 minutes in just enough boiling, salted water or chicken broth to allow them to float. During the last 5 minutes of cooking, add a bag of frozen veggie mix. Ladle pelmeņi, broth and veggies into bowls. Stir in a tablespoon of sour cream and a teaspoon or two of soy sauce (adjust to your taste). 1. This is just one type of filling. Obviously you can put just about any type or combination of meat in. 2. I ground the onion and steak together in my meat grinder. However, there are many ways to accomplish the same end result, including processing both in a food processor, using pre-ground meat and grated onion, and so on. I find grinding it myself in the meat grinder gives the best and fluffiest texture. This entry was posted in ground meat, latvian, recipes, russian, untranslated. Bookmark the permalink. Looks amazing. Thanks for sharing. I love the plemeni I get at Cafe Yarkama in the Market. I’ve never thought of making my own. Depends why they dislike it… if they don’t like the sourness, you might want to try a small batch of the braised sauerkraut to see if they would like that. It really is mild and tender, without a lot of the overpoweringly “pickled cabbage” taste.